Paul W.S. 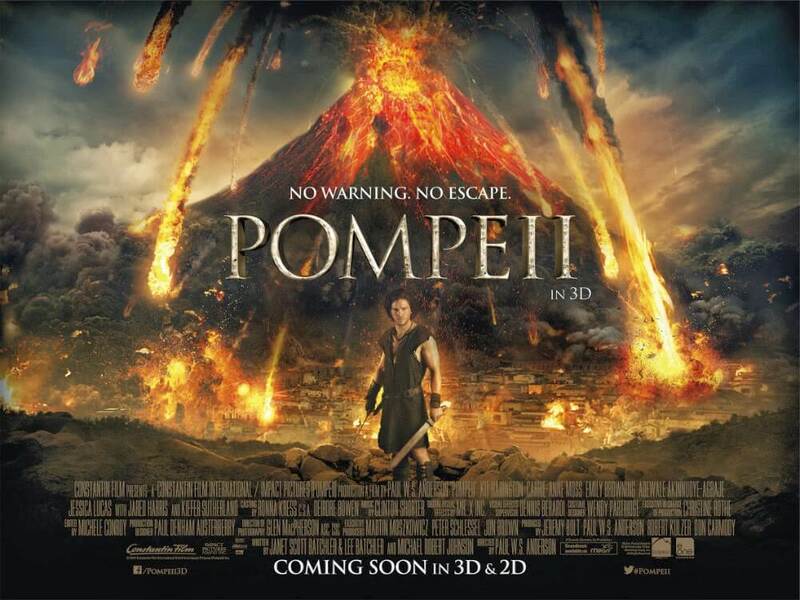 Anderson’s action-heavy take on the tragedy of Pompeii can best be summed up as “Emmerich Lite”. But whereas the director of Independence Day, 2012 and other mindless action/disaster movies went all-out epic with its stupidity and had a ball every time, Anderson surprisingly manages to keep everything restrained, from the story to the characters to even the action, which doesn’t equal out to much in the ways of entertainment or (intentional) amusement. The story, to start with, is on loan from various different outlets, including the opening to Schwarzenegger epic Conan The Barbarian – Kit Harrington’s protagonist watches as his entire family is slaughtered by the film’s villain Kiefer Sutherland before being forced into slavery – the tired romantic sub-plots from Titanic – boy from lesser background meets and falls for girl of privileged background, giant natural disaster gets in the way – and, last but not least, the sword-swinging and sandal-wearing clashes of Gladiator, 300 and the like. As you may have already guessed, originality is not Pompeii’s strongest suit. In fact, one of the most surprising things about this movie is how disgustingly simple the story is – at its core, it’s nothing more than the typical “hero must rescue pretty damsel in distress” template that was old even by the time Mario set off to rescue Princess Peach. On the one hand, this makes the film mercifully short at only an hour and forty-four minutes which means it isn’t bogged down by weary and tiresome plot threads that could have sunk it faster than Titanic (no pun intended, but on the other it leaves very little room for developing anything else that could help the film stand out a little more rather than just being a pale and soulless imitation. “Soulless” is also a good way of describing what this film considers to be fleshed-out characters, when in actuality they have about as much personality as a fart in a swimming pool… and even THAT would have been a much more complex character than the ones on display here. All of them are hollow archetypes presented with no subtlety or emotional connection, which leads us to not care whether or not they get engulfed by that volcano (which, given how flat and bland everyone is, might just be the most developed character in the entire thing). To be fair, most of the actors brought in to fill these parts – Harrington, Emily Browning as aforementioned love interest, and Adewale “gaze in wonder at how unpronounceable my name is” Akinnuoye-Agbaje as a fellow gladiator being noteworthy ones – actually do their best with such thin material and manage to leave a decent if unspectacular impression. However, to counteract, we have actors who’ll either stand around wondering why they’re there in the first place (seriously, Jared Harris, you’re too good to be here playing a character named after a Hogwarts professor), delivering uncomfortably hokey British accents (looking at you, Carrie-Anne Moss), or just going with it in an all-out ridiculous and hammy display. Enter Kiefer Sutherland as the evil Senator Corvus, who gives Jeremy Irons in Dungeons and Dragons a run for his money with an over-the-top performance that leaves you surprised they didn’t give him an evil moustache to twirl; he’s that cartoony. He is very entertaining to watch, but perhaps not for the reasons the actor nor director expected. When the actual volcano does erupt, there are moments of decent visual effects which, while not the best, get across the peril of the situation fine and produce it on a large scale. But although Pompeii does eventually fall and consume everything in its path as per the history books, it needn’t have bothered – there was literally nothing valuable in terms of story or characters to consume in the first place. Pompeii is a bland tie-in to a tragic historical event, with characters bereft of personality and an overused plot trying and failing to make up for its lack of logic. Its mercifully short running time, however, thankfully saves it from being a complete bore since it makes everything on-screen go by much faster and allow us to depart the auditorium quicker than anticipated.